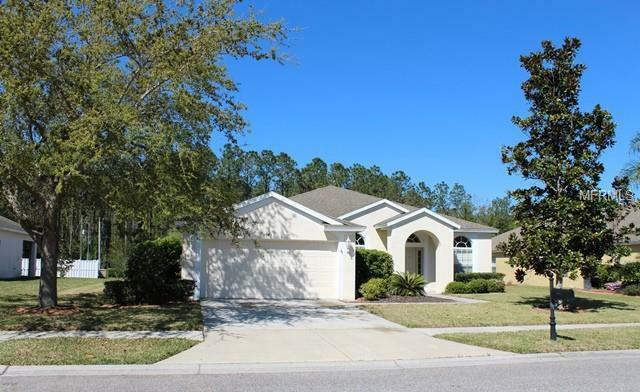 AFFORDABLE 4 BEDROOM IN GATED COMMUNITY. Spacious 2184 Sq. Ft. Home with High Ceilings and Open Floor Plan. Front Entry has Sidelights and Tiled Interior Foyer. Formal Living & Dining Rooms have Arched Windows, Decorative Columns & Crown Moldings. The Open Family Room has a triple sliding glass door to the covered lanai and provides a beautiful view of the back yard and pond. The Kitchen features 42 Inch Maple Cabinets and a Closet Pantry. The Master Suite features a Spacious Bath with a Huge Walk-In Closet, Double Sink Vanity, Separate Shower & Relaxing Garden Soaking Tub. Convenient Interior Laundry Room. This Deed Restricted Community Features a Gated Entry and Low Association Fees without any costly CDD Fees.